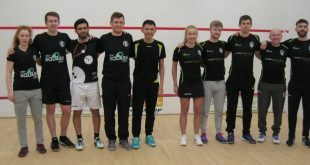 Team Chichester’s third match of the season, and second at home, played London Coolhurst. The squad was determined to defend its unbeaten run and maintain top position on the League. 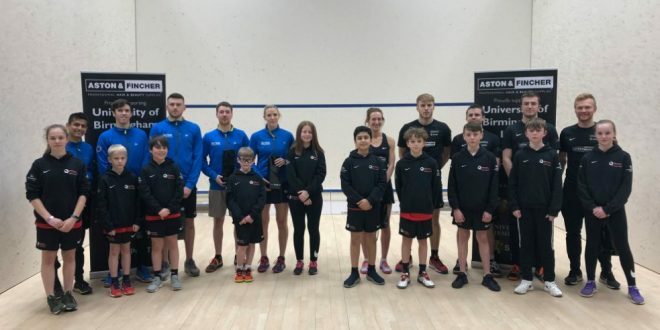 Jasmine Hutton made her debut for Chichester to play alongside the team members who have played in the first two matches – Paul Coll, Nathan Lake, Tim Vail and Miles Jenkins. 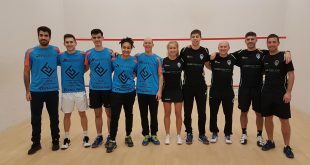 Last month Jasmine was runner-up in the final of the British Junior U19 National champs. First on the glass back court Chichester’s Miles Jenkins [WR266] played Elliot Selby [WR195]. Jenkins took a commanding 8/0 lead in the first game by hitting his targets and taking the ball early. Selby then took advantage of Jenkins’ drop in pace to put 6 points back on the board. Jenkins held his nerve and eventually won it 11/6. The second game was quite fragmentary by both players and the 11/4 score-line highlighted a more consistent Jenkins taking the second. In the third Jenkins continued to play a better length and won the match 11/6 for Team Chichester. Jasmine Hutton [WR237] started well against Hayley Mendez [WR78] and her all court attacking game gave her a 9/6 lead before she faltered to lose it 10/12. Jasmine determinedly fought back and took the second to level the match 11/7. Mendez regained hold of the match to take the third 6/11. Midway through the fourth Jasmine turned her ankle. She resumed play after an injury time-out but lost the third 4/11. Nathan Lake [WR74] played Angus Gillams [WR66] and Lake was in no mood to hang around and he took charge from the outset. He played tidy, efficient and error free squash throughout and ran through Gillams 11/6, 11/5, 11/2. Meanwhile on the adjacent championship court Tim Vail lost a tight opener 9/11 to Ondrej Uherka [WR190]. Whilst slight impatience and going too short too soon cost him the first game, more patience combined with some sublime touches enabled Vail to take the second 11/8 to even up the score. The next two games involved long rallies and, a lot of fortitude from Vail and some great touches at just the right time. 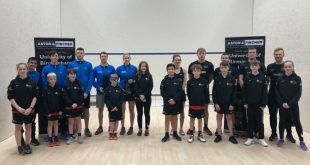 Vail eventually ran out a 3.1. winner in a very hard fought match to give Team Chichester another victory – thereby upholding their unbeaten run. Chichester’s rising star, Paul Coll [WR33], played former Chichester number one string, Adrian Waller [WR36]. Coll was relentless from the beginning; his retrieving abilities and counter drops forced desperate errors from Waller as Coll speedily took an 11/3, 11/3 lead. Waller threw caution to the wind in the third and went for some great nicks, which came off, and kept him in the game. Waller reached 8/10 before Coll applied more pressure and the errors from Waller returned. Coll took the game and the match 12/10. A 4.1 win for Chichester surely keeps the squad top of the table. 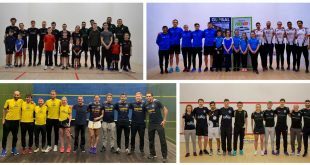 The next match will be away to Surrey HRC on 13 December.